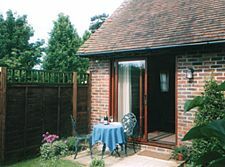 Honeysuckle Cottage in North Mundham is a fully self contained studio style holiday accommodation for two people. It has its own small enclosed garden and is located on the owner’s working flower nursery. North Mundham is a quiet village approximately one mile south-east of Chichester in West Sussex. 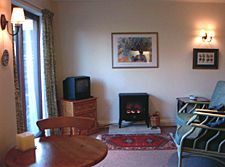 The adult only cottage has been furnished to a very high standard to ensure guests are comfortable during their stay. All linen and towels are included & the bed is made up ready for your arrival. There is a village shop two minutes away and a pub with food within walking distance. The cottage is only half an hour from Chichester where there are many shops, restaurants and cafes to visit. Nestled at the foot of the South Downs, Chichester is surrounded by beautiful countryside, sandy beaches, fishing villages, historical and family attractions, offering incredible diversity to suit every visitor.